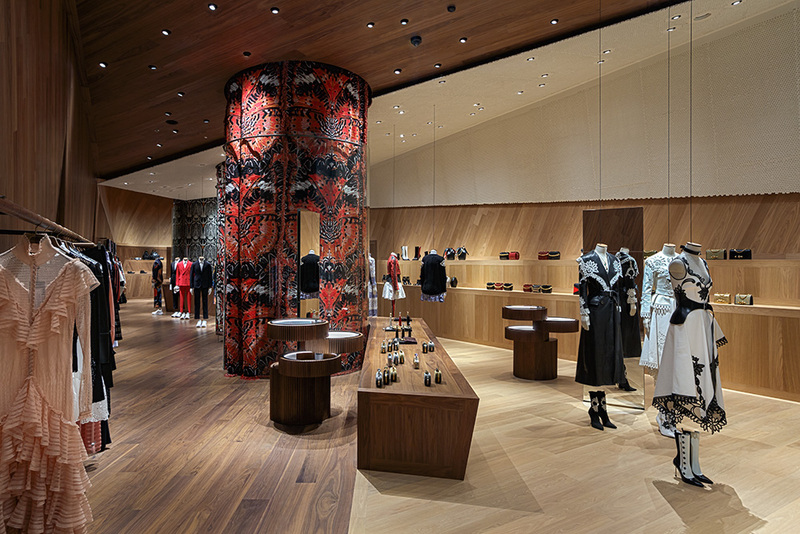 Today, team a&e got a first look of the new Alexander McQueen boutique in the Dubai Mall fashion avenue. It is the second in the world to showcase the new design concept conceived by the brand’s creative director Sarah Burton in collaboration with the architect Smiljan Radic. Nature plays a major part in her designs which is echoed in the style of the boutique. The open wooden space, a mix of oak and walnut, feels airy where the clothes capture the imagination. The central pillars, draped in butterfly print tapestry, stand out and further bring together the codes of the house. These are created in the McQueen studio, elaborately woven and embroidered under the direction of Burton and her team, and become part of the architecture which you can also find in the changing rooms. Elsewhere, a new cladding – ‘cotton-crete’, a cotton-based papier mâché – has been developed for the space. It appears in white, in panels alongside the wood, and in black, cladding the façade of the store which is otherwise full-height glass. It has become even more important for the stores to contain the same energy as the collections, and change with the vision of the designer. The new space truly reflects Burton’s love for playing with raw and the refined, the contemporary and the traditional – which is probably why Kate Middleton can’t stop wearing her creations.